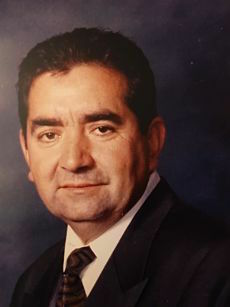 Elias Oscar Vallejo was born December 12, 1945 in Durango, Mexico. Oscar, as he liked to be called, left his loving family on December 30, 2015. He moved to Santa Barbara in 1964 to pursue a better life. Elias worked 20 plus years in the famous El Paseo and Somerset restaurants. Elias enjoyed decorating his home with Spanish architecture and watching sports. Although he was successful in his own right, he strongly valued education. Elias sent his children to Notre Dame Elementary and encouraged his sons to pursue their educational careers. Above all he was a loving grandfather that spent his last years watching his five grandchildren grow into beautiful young people. They brought him great joy and happiness with every encounter. Elias will be missed by his wife of 44 years. He is survived by his wife Martha, sons Oscar, Valentin and Cesar, and five grandchildren Madaleena, Maiya, Lilly, Valentina, and Cain. Rosary services will be held at Welch-Ryce-Haider funeral home on Thursday, 1/7/16, at 7:00pm (15 E Sola St, Santa Barbara, CA 93101). Funeral services will be held at Our Lady of Sorrows Parish on Friday, 1/8/16, at 10:00am (21 East Sola Street).